If you want to rank for car accident and personal injury keywords reach out to me at jesse@wojdylosocialmedia.com. I have monthly SEO and content packages that can help you get more clients from your website. Almost every single personal injury lawyer in America wants to rank for [my city] car accident lawyer or car accident attorney. What most law firms have come to realize is this is the most competitive term on the Internet. You read that correctly. Not the most competitive term in the legal industry, the most competitive keyword when it comes to all keywords. Personal injury and car accident keyword phrases can cost as much as $150 to $200 per click when purchased through Google Adwords. With this being the case, it is important to come up with a strategy when it comes to ranking #1 on Google Search for this particular phrase. You are not going to buy a domain and rank for “Washington, DC car accident lawyer” in two weeks. Heck, you likely won’t rank for that particular phrase in two months. Think of SEO and ranking in search as a business. When you started your law firm you weren’t making money on the first day. You had to build your firm through referrals and other forms of marketing. Even after getting clients you still had to get the settlement checks from the insurance company or the businesses/individuals that were negligent. Once you started getting a few cases money had to be spent on private investigators, accident reconstructionts, paralegals, doctor advice and more. This investment allowed you to win the case, get the settlement check and sink more money into your practice. The same is true with content and SEO on a website. Your first few pieces of content are not going to be your money makers from day one. If you continue to build them and expand your website you are going to realize more and more people finding your legal website through Google search. Early on, you will not be able to rank for “Los Angeles car accident attorney” but you will likely be able to rank for “Car accident on Howell Mill Road near WalMart legal advice”. Although this is only getting searched once or twice a year it is still the potential to have a client see your legal website and contact you. 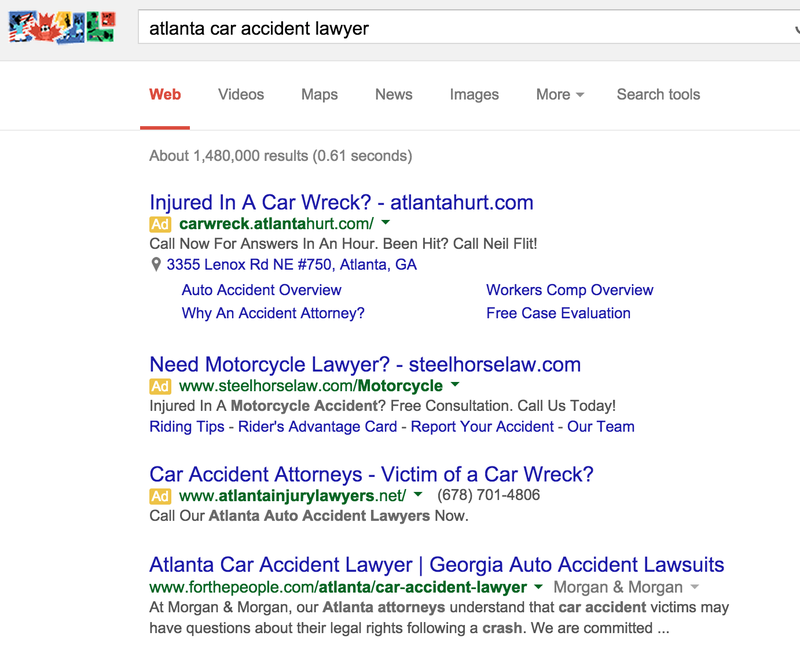 If you are only going after short tail keywords such as “Atlanta car accident lawyer” you either better have a huge budget or a very large offline presence that creates tons of natural links to your website. Focus on some long tail personal injury and car accident keywords to get cases in the early days of your website. You will find that these articles and blog posts only help you rank for keyword phrases that would be considered “money” keywords. Links will always matter with the Google algorithm because that is how it was built. Links tell Google how authoritative a website is on a certain subject matter. That said, links are not everything. As a personal injury lawyer you will want a blend of natural links and quality content. One way to quickly build natural links is to produce some great content on a consistent basis. If your personal injury website is producing a blog post a day the numbers are in your favor. The likelihood of receiving a link from one of 25 blog posts is much higher than the likelihood of receiving a link from one of five (5) blog posts. If you have a team or copywriter that can produce amazing content you can never have enough. In fact, the initial part of your SEO and marketing budget should go to content. Why on earth would a news outlet or another legal website link to your website if you only have a total of 10 pages including blog posts? Get some quality content on your website and the links will follow. One of the best ways to get natural links is through real world relationships. If you are a personal injury lawyer you work with professionals that likely have a website. Why not write a guest post for an accident reconstructionist website? If you work with specific doctors and medical professionals that help your clients on a lien basis why not write some content for their website? If you are giving them free content both parties benefit. The doctor will be getting quality content for their website and you will be getting a natural link to your legal website. Both websites will rank higher in Google search with this partnership. Remain patient and continue to build those real world relationships. You never know when you will bump into someone that owns one of the most powerful websites related to your area of practice. Getting to #1 for [my city] car accident lawyer is not easy. As a personal injury attorney you likely do not have time to sit and write content and build a natural link portfolio. I have helped a number of clients compete in highly competitive cities for car accident and personal injury related keywords. If you would like to work with me reach out to me at jesse@wojdylosocialmedia.com. I have monthly SEO and content packages that will help you dominate Google search and your competitors. Is Law School or Medical School the Right Decision? | Who Are Trevor and Madison from the Utah State Snapchat?